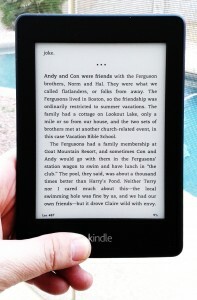 Amazon Kindle Paperwhite, outside in full daylight. I am a reader. In a normal month, I read three or four books, a mix of fiction and non-fiction. About half the books I read are bought at airport newsstands or borrowed from my local library. The other half I buy digitally (on iBooks when I owned an iPad and more recently through Google Play to read on an Android tablet and/or phone). I like the portability of reading books digitally and buying online has always made sense to me. And as I start to look more closely at the publishing options for my own fiction, I keep hearing that the Amazon Kindle environment is the best platform for authors; easiest marketplace to enter, pays the best royalty, is the most successful selling environment for those Indie authors who publish on multiple digital platforms. In fact, barring the bestseller list, Amazon rankings have become the standard by which author popularity is measured. Is this because the Kindle is the best platform for readers? I've never owned or used a Kindle. I'd always stuck to the marketplaces of convenience (the ones that supported the tablets I owned). But indie author praise and repeated good vibes from working writers has made me accept that I need to understand the Kindle environment before I make my decisions on how to publish my novels. I Bought a book on Amazon - I downloaded the sample to Stephen King's Revival. I love Stephen King. And even if every book he has written hasn't been to my liking, and even if he is an investment in patience through the first hundred pages to wait for him to start really building his story, he is a master at telling stories and if you stick with his novels, they're always satisfying to finish. I read the sample last night before I went to sleep. The device was easy to hold, much lighter than my Samsung Android tablet, and I didn't get nearly the eye strain I sometimes get with the tablet (if I read too long on the tablet then go to the bathroom, for example, my vision will have a 'burned' square in the center). I read to the end of the sample and bought the book - a simple transaction to close - and continued reading. I borrowed a book from my library - We have a great digital library system in the Phoenix area. Two actually (I belong to both the county and my local city library systems). They are both run through a service called Overdrive. I can borrow eBooks, audio books, and other materials directly on my PC, Android phone and tablet using the Overdrive app and have been checking out digital books for months. I'm especially into the late Stuart Kaminsky's Toby Peters mysteries. The main character is a hard-boiled 1940's private detective and most cases involve Peters working with the Hollywood stars of the day. I logged into my library system, 'borrowed' the next Toby Peters mystery in the series and when I clicked the read button, the option to send the borrowed book to my Kindle appeared. I clicked. Amazon popped up. One more click to initiate the borrow and sixty seconds later, the book was sitting on my Kindle. 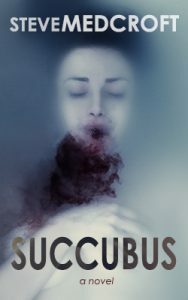 I downloaded a .mobi book directly into my Kindle - I wrote a couple of days ago about an author using some kind of Twitter follower building application to offer me a free download of her first book. I originally downloaded it for Google Play. I went back to the download site and saw that it was offered in a Kindle version so I downloaded it using my browser and proceeded to try and figure out how you put stuff into the Kindle via a USB cable. There was some mess about installing a plugin on your browser call 'Send to Kindle' but that seems to only allow you to clip websites and have the content sent as a document to your kindle. This would be great for downloading long blog posts or news stories to read later but I couldn't use it to upload this .mobi file. I checked in the My Computer app on my PC (the place where you can see what drives are connected to your computer and how much space you have in each one. The Kindle was listed as a USB drive so I just took a chance and dragged and dropped the file onto the Kindle. And it worked. The book is now on my Kindle. I'll have more feedback as I get more practical experience but I immediately see the benefits to the Kindle over reading digital material on a PC, tablet or phone; the reading experience is less harsh on the eyes, the ability to buy, borrow and upload books is simple, the thing is tiny and therefore supremely portable, and the battery lasts forever. I immediately took the hardcover novel I borrowed a couple of days ago from the library and can't believe I was carrying around that giant, heavy thing when I could have the same book in this slender little cat. I am excited to have several books ready to read any time without having a pile up on my nightstand and will give more feedback as I gain more experience with it (I am especially interested to understand how you find and discover authors and books this way versus browsing a library or book shelf). 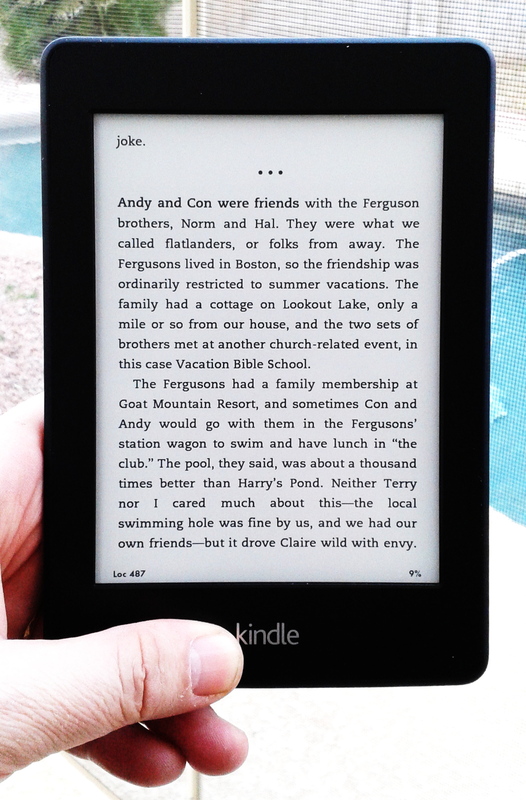 Do you use a Kindle? A different device? What do you think?